Most cars—and especially SUVs—put practicality ahead of style. Sure, they have all the space you need, but don’t you think they’re a little ho-hum? But at Budds’ we’ve got the perfect solution. If you want to drive something that looks and feels special, consider a sportback. Combining practicality with swooping, sensuous styling, the “sportback” is the hottest trend in the automotive world today. It’s a class of car that draws envious looks from everyone who sees one. 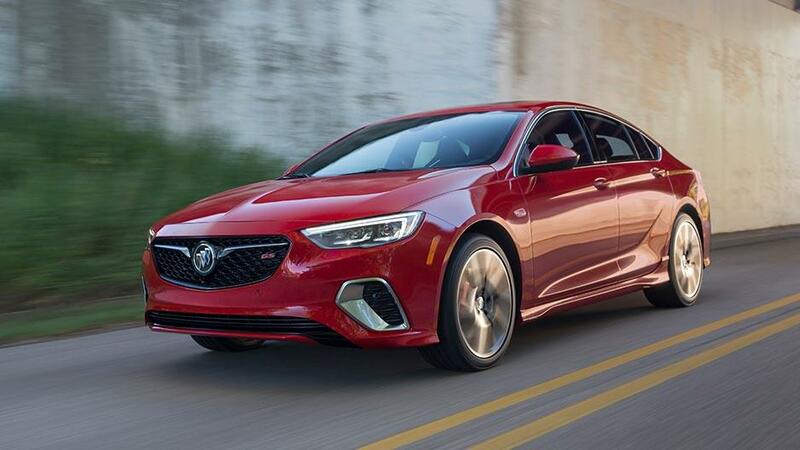 Drive a Buick Regal Sportback and you may even receive appreciative nods and the occasional thumbs-up to recognize your good taste. Traditional sedans have a “three-box” design: hood, cabin, and trunk. 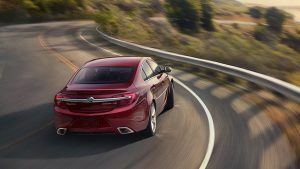 The Buick Regal Sportback is more of a two box with a long roof that sweeps down to the taillights in one flowing movement. The effect is more like a coupe than a sedan, but you still get four doors for easy access. You also get lots of space for luggage, thanks to the huge liftgate that opens up high. Unlike an SUV or hatchback though, this liftgate is almost horizontal, which is what makes this car look so sensational in profile. The Regal Sportback is just as dramatic viewed from the front and rear. The waterfall grille is wide and deep with the tri-shield badge proudly displayed front and center on a horizontal bar. Narrow headlights lend a purposeful attitude. Along the flanks, a crisp fold runs back through the door handles to the taillights and bright trim wraps around the side windows to accentuate the curving roof. And from the rear, well it looks wide and low, with distinctive LED tail lights. Or to put it more simply, it’s a great looking car. Inside you’ll find quality materials and elegant design. The center console angles slightly towards the driver for better presentation of controls. The gauges look almost jewel-like and the seats hold and support you without feeling overly cushioned. Preferred II Sportbacks come equipped with goodies like remote start, dual-zone automatic a/c and a heated steering wheel. Essence trim ups the ante with leather appointments and heated front seats with 8-way power adjustment. If the regular Regal Sportback is sumptuous, the Regal GS is very special indeed. It might interest you to know where the GS comes from. Short for “Gran Sport”, GS models have always been the most powerful and best-equipped Buicks. From the 1965 Skylark Gran Sport through to the muscled GSX of the early 1970’s GS Buicks are something special. The 2018 Regal GS maintains this tradition. Like the Essence trim Sportback, AWD is standard, but under the hood, you’ll find a 3.6 liter V6. This makes 231 kw and 400 Nm of torque. In addition, and to underline it’s performance credentials, the GS rides on larger 19” wheels. Not only do these slim down the tires for increased cornering stability, but they provide space for big Brembo calipers to grip the brake discs. And on top of that, there are adaptive dampers for improved grip and ride comfort. Lest you conclude the GS is all about performance, it’s also loaded with luxury. The special performance seats are wrapped in leather and feature eight-way power adjustment with memory functions. Naturally, they are heated but they also come with ventilation and the driver gets a massaging function! Imagine how good that will feel on your drive home! Should that drive become a little more exciting than you’d want, take comfort in the advanced safety features that come standard on the GS. These include Lane Change Alert with Blind Zone Alert as well as front and rear Park Assist and Rear Cross Traffic Alert. Sportback styling is still a new “thing.” Most people aren’t sure what it is, but when they see one they want one. 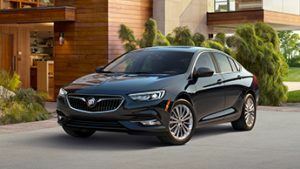 The Buick Regal Sportback is both beautiful and hugely impressive to drive, especially in GS trim. Don’t just take our word for it though. Come down to Budds’ and see for yourself.